Whole Grains – What are they? All grains begin as whole grains. Whole grains are the entire seed of a plant. The seed also referred to as a kernel has three key parts. 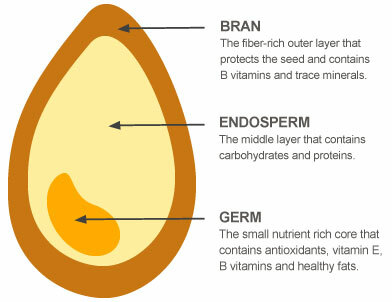 The bran, the germ, and the endosperm. The bran is the outer skin of the kernel, this tough protective layer keeps the germ and endosperm safe from the elements such as sunlight, water, pests and disease. Locked in this bran are very important antioxidants, B vitamins and fiber. The germ is the life which sprouts a new plant when fertilized by pollen. 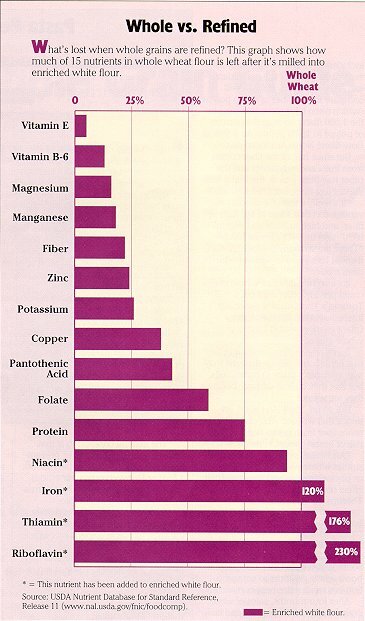 The germ contains many B vitamins, minerals, healthy fats, as well as some protein. The endosperm is the food supply for the germ, which provides essential energy to the young baby plant. It is responsible for sending the roots down for water and nutrients, and sending sprouts up for sunlight’s photosynthesizing power. The endosperm is the largest portion of the kernel. The endosperm contains starchy carbohydrates, proteins, vitamins and minerals. 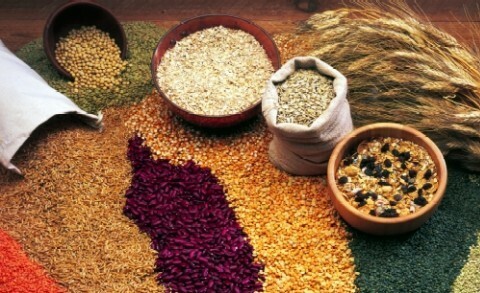 Whole grains are very healthy as they contain all three parts of the kernel. Unfortunately, refining removes the healthy bran and the germ. This process removes everything but the endosperm. This process removes 25% of the grain’s protein, along with seventeen key nutrients found in the bran and germ. Some manufacturers attempt to add trace amounts of vitamins and minerals back to enrich refined grains, resulting in additional nutrition, however, it never adds up to the nutrition of the whole grain untouched. Whole grains are healthier, as they naturally provide more protein, more fiber and many very valuable vitamins and minerals. There are so many ways to eat Whole grains, they can be eaten whole, cracked, split or ground. They are commonly milled into flour for breads, cereals and other foods. Be sure to read your food labels and look for foods that contain whole grains. If a food package or label states that the food contains whole grains, the “whole grain” is required to have the same proportions of bran, germ, and endosperm as the kernel does before processing. Whole grains make up 10-15 percent of grains on store shelves. Try your best to consume at least half of your grains as whole grains and move towards getting them all in as whole grains. As you transition you may find it challenging to locate these healthier whole grains. I have found this Whole Grain Product Finder put out by the Whole Grains Council to make finding whole grains much easier to locate them. Hi friend We appreciate you giving this information around. Normally i would not comment on Information sites. However i just like it. If only extra content articles plus content material over the internet is up to very helpful and beneficial than this place. Great posting, thank you so much Best wishes.